1.Large enough to carry iPad,phones, umbrella, wallet and other stuffs. 2.Be comfortable to hold it in hand/shoulder.Go well with any outfit in any occasions like work/business/dating. 3.We earnestly promise that we will provide you the highest quality products and the best after-sale services. Please feel free to contact us when you needs help, and we'll contact you within 24 hours. 4.Due to differences between monitor displays, actual color may vary slightly from image.Please allow a 1-3cm measurement error due to the manual measurement. 5.NOTE:Wash it with clean water in ordinary temperature.DO NOT wash it with hot water and alkaline detergent.Hang to dry and store in ventilated place instead of sun exposure. 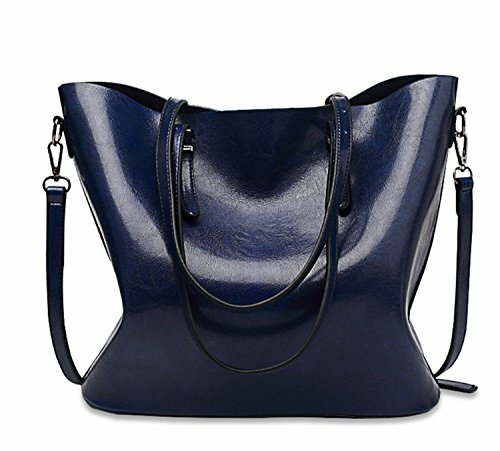 Material: High Quality PU leather and polyester lining.Durable and fashionable. Dimension:32x29x13cm(L*H*W)/12.6x11.4x5.1inches(L*H*W),weight:about 0.7kg. Please refer to the size before you purchasing. Thanks for your kindly understanding. Structure:1 main compartments, 2 internal zipper pockets for wallets and another 2 pockets for keys/card and cellphone etc. All stuffs can be well organized inside. A bag comes with a removable and adjustable long shoulder strap. Elegant high-end design goes well with any outfit in any occasions like work/business/dating/Daily/travel/school, and you will feel comfortable to wear it. If you have any questions about this product by SIFINI, contact us by completing and submitting the form below. If you are looking for a specif part number, please include it with your message.